SIOUX FALLS, SD – The Sioux Falls Skyforce will be expanding on its traditional military night this season, now also recognizing local members of law enforcement, fire and rescue, and first responders in addition to all military personnel. Free tickets to the inaugural Hometown Heroes Night on Friday, November 30 are available to all men and women of service and their families. 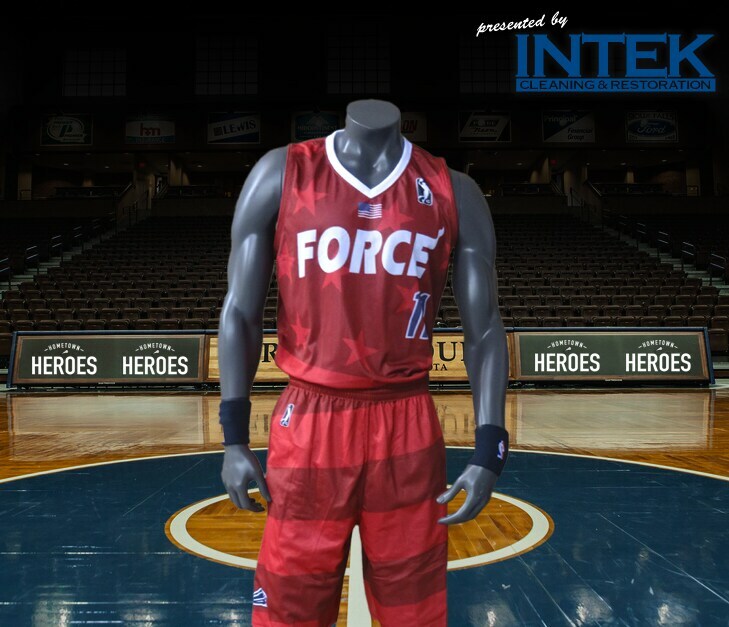 Skyforce players will be donning red, flag-themed jerseys which can be purchased online in advance of the game. All remaining jerseys will be bid on during the game, with the jersey being awarded to the highest bidder by the end of the third quarter. Winners of the jerseys will be announced shortly thereafter and all of the proceeds from the auction will benefit Operation Cares. In addition to the auction, the Skyforce will also host an enlistment ceremony at halftime. Young men and women who have signed up for the Air Force, Army, and Marines will take part in a ceremony that will enlist them into one of the aforementioned organizations. To reserve tickets to Friday’s game, call the Skyforce office at 605-332-0605 or stop in at 2131 S. Minnesota Avenue in Sioux Falls. Service members and their families may also redeem tickets on the night of the game at a designated table in the front lobby of the Sanford Pentagon. In March of 2003, the Sioux Falls Skyforce created a charity to benefit family members of soldiers who were sent overseas for service. Operation Cares was launched with the help of over 20 Sioux Falls businesses. This effort has been very successful as it has raised over $175,000. All proceeds have gone to help military families with everyday needs such as car repairs, groceries, home repairs, etc.